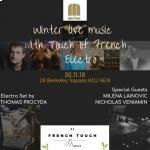 Join us for an evening of live music by two international artists, and a French DJ in an exclusive Members Club in the heart of Mayfair. You will enjoy a complimentary drink and free access to the club for 2 months. Discover new talents, and make new connections, in this elegant setting with Christmas decorations all over! And who knows, perhaps some snow will fall over the club on that very special night!